Don’t you want to feel like you look pretty? That you’re a good representative of your family? I do. I wanted it so badly. That’s why I first taught myself how to apply makeup. It made a world of difference in how I felt and therefore it made a difference in how others saw me. Because after all, makeup isn’t the Devil. 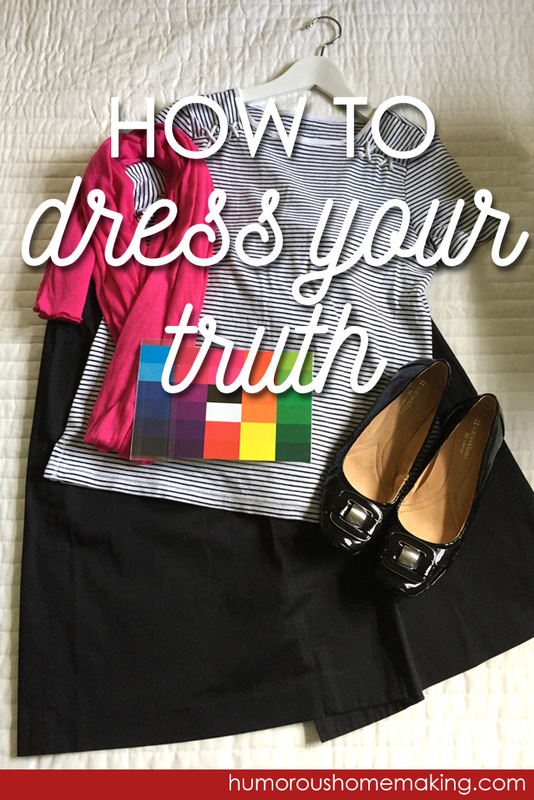 Then, I found out about Dressing Your Truth® (DYT) and I finally understood myself when it comes to dress and my personality. Finally coming to grips with my personality and how it’s okay to be the way that I am, I also discovered that I can dress to match my personality to make myself shine. There’s nothing like feeling wonderful in the clothes you wear, whether it’s business casual or t-shirts and jeans. I’m a type 4, BOLD and firm personality. I know most of you are thinking, “Well, yeah. We knew that.” But, I tried to hide it. And I also didn’t know I should be dressing to match my personality. Now, I don’t feel like I’m squandering budget money. I know what to buy. I know what makes me feel good and look pretty. 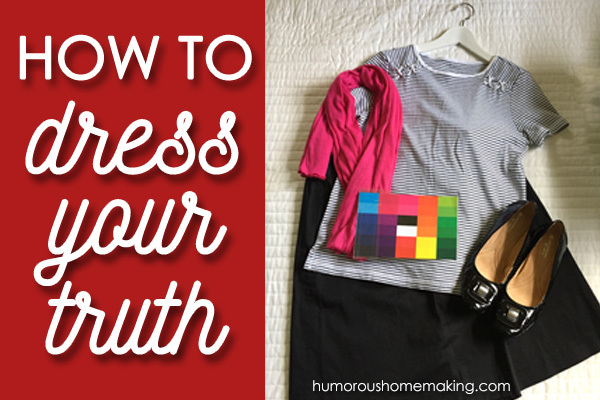 I know what makes me feel like I’m dressing my truth. I’m bold. That’s okay! Have you taken the FREE ecourse to find out your type? Man – that’s a lot. Yes. I agree. But I also know that sometimes it’s okay to invest money in ourselves. Especially if it will save us money in the long run. Of course, no matter the cost, if it’s not in the budget, it’s not in the budget. But, it’s still fun to take the free ecourse and learn your type. 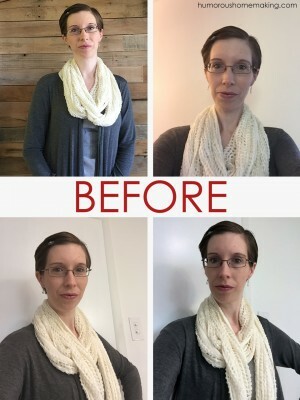 Here are my before and after photos. No more gray for me! I am going to shine and embrace my bold personality…pinks and reds and blues! I’m still appreciating this post! I took the course over the weekend (after emailing you – thanks for the feedback!). I took the free version last spring and was convinced I was a weird 2/3/4 hybrid but could not possibly be a 1 because 1) I work at a very serious job (/sarcasm but actually there are a lot of serious people here), 2) 1s seemed like the flighty & annoying type and 3) no one who wore those fun colors could possibly be taken seriously. After watching an old home video recently, I saw a lot of my type-1 5 yr old daughter in 5-yr-old me on the video. That sparked me to go back to the course and lo and behold…. I’m a type 1, probably secondary 4 because I need structure too. Now I understand why I have felt so blah in recent years. I thought my job should dictate who I was, but really I should be dictating how I approach my job and family life using my natural talents and characteristics. How freeing!!! (<-Apparently type 1s use a lot of exclamation points so there ya go). I’m really interested in purchasing this course. I did the free online course and it was very interesting and kind of fun too! I’m just a little nervous about it being new age. I did a brief search online about her and those types of connections and I didn’t like what was coming up 🙁 As someone who is a Christian and has gone through the course, do you see any ties between her course and new age? If it’s questionable, I’d rather not purchase it- but I really want to learn how to dress better!! I adore that Zebra stripe top with pink scarf for you! Looks great! Thank you! I found it on Thred UP! I would email them and ask. They have great customer service. I have taken the free course and read the book, but still am struggling between 3 and 4 constantly. I keep rereading things and just can not make a final decision. I have always wanted to purchase the whole course in order to get the help in figuring it out and the support, but that is just not in the budget and will not be for a long time. So, I would love to win the course and finally be at rest. I have very few clothes and very few means of updating my wardrobe and I do not want to waste any money on the wrong clothing. Looking forward to the giveaway. Natalija, have you watched some You Tube videos to see if that helps you get it figured out? It doesn’t go up until Friday. How do you sign up for the giveaway tomorrow? I would love to have a chance at the free course. There will be a form to fill out in the post. I discovered DYT back in September when I read about it at MSM. I was torn between type 4 and type 2. I had been predominately dressing as a t4 prior to DYT, so It has been hard for me to give up my black and white! However, I am fairly certain I am a type 2 and you have encouraged me to embrace it a little more now. I was still struggling for some reason to embrace it fully. I need to be thankful for who I am and know that it is ok to be me! Thanks for these posts! Oh…on a side note, I would love to follow you on Instagram but every time I try to follow you, it immediately unfollows you! I’m not really sure how to fix it! I’m sorry about that, Holly! Can you tell me your screen name there? Also, yay for embracing your truth! My screen name is hollybeth83. Hopefully you can fix it 🙂 thanks! Back in the 80’s (I know this is before your time) there was a book written called, “Color Me Beautiful” by Carol Jackson. It was based on skin tone, hair and eye color. Knowing this you would then fall into four categories, spring, summer, fall or winter. The category you fell into decided your color palette. This book saved me from so many poor choices when purchasing clothing! If it is not in my color palette I am not going to like it when I get home. Also the book discussed style. It makes my shopping days so easy and as I purchase for my children. I know what colors will look best on them to make their eyes pop and their smile show. Oh, I read that, too! I liked the color palettes it provided. Thank you for this! I’m really looking forward to finding out what type I am. Let me know! I always find it super interesting. Would this course be suitable for my 14 year old daughter? She is just beginning to ‘find her legs’ in the lady department. Yes, I think so. The free part would give her a good gauge about if she would like it or not. I think that’s a great idea! I wish I’d had some help discovering my fashion style as a teen! I’m so glad this is making such a difference for you! WOW!!! I can SEE the difference in your face….it shows that you love the way you look!!!! YES! I am so glad it shows, Rayelene! I’m also a Type 4, but for a while, I thought I was a Type 1 (I wanted to be fun/cute/bubbly). I’ve settled on Type 4/Secondary 1 and love it (we can still be fun and lively). DYT is amazing and has allowed me to not only learn more about myself, but also helped me to understand others a little better (such as my T3 hubby). It makes things go much more smoothly when you understand each type and how you need to approach them/frame things for them. I’ve been inspired to continue exploring typing/colors/fashion and have been reading about how to dress for my “problem areas”. Last week I had a consult with a fashion blogger and discovered what my signature color is (purple). I feel like an expert when I walk into the stores now; I know how to choose the best colors, design and style for myself. Next up: using all of this knowledge to put together a capsule wardrobe for each season! Oh, a signature color! How fun! Hi Stacy…you make the sun shine!! I love seeing your creative mind and cost-saving efforts at work!! Yes!!!! You Look fabulous! One of the things I love about growing up (and getting older) is I am more and more comfortable in my skin. I don’t worry (as much) about what other people think of my choices, which used to leave me drab and patternless. If I feel fabulous in it, I go for it. Such a big change for me. And you look amazing in zebra and hot pink. Who knew?!!! I know, right?! Me in Zebra! You have to be joking…but no. I love it!!! 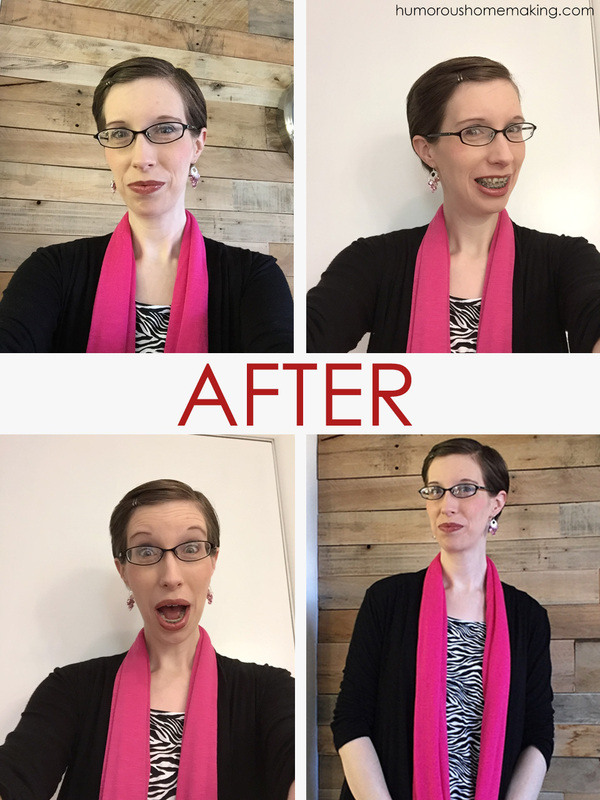 The new colors & style look great on you! It’s not that you looked “bad” before but it wasn’t “you.” You truly look brighter & happier when you dress your personality. You look like how you come across on paper now – sharp, funny, lighthearted. Love it! I took the free ecourse a while ago, but I don’t remember what my type was. I think I was cross between two of them. 🙂 However, I couldn’t afford the full course, so I’ll be checking back in to enter the giveaway. I can tell that you’ve really enjoyed what you’ve learned. I’ve been following the free DYT recommendations for a year before I finally took the course. I LOVE it…it has answered so many questions for me and it makes sense. I am a Type 1 with a strong secondary Type 3…and now I am not afraid to dress accordingly. I would highly recommend this course to anyone. Thanks for the feedback, Missie!